Cold and Flu : Cold or Flu: What's the Difference? It starts with the sniffles. Then you start sneezing, and realize your throat is sore. It must be a cold. But then you start to feel a little achy and have a mild fever. And then the dread sets in: "Oh no -- is it the flu?" The common cold and the flu are both respiratory infections and share many symptoms, but they are not the same. Colds are commonly caused by the rhrinovirus, but more than 200 other viruses can trigger them. Symptoms typically stay above the shoulders -- runny or congested nose, cough, watery eyes, sore throat, and sneezing are common. They tend to build over a couple days. 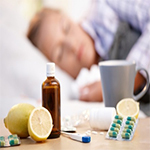 You may feel achy or have a low fever, but it will be much less severe than the flu. Most of us catch about two colds a year; kids generally get more colds because their immune systems are immature and they haven't developed immunity to many of the viruses that cause colds. The flu, on the other hand, is commonly associated with that I've-been-hit-by-a-truck feeling. It's caused by either type A or type B influenza virus. Symptoms start like those of the common cold but quickly get much worse. In addition to a cough and runny nose, symptoms include chills, hot flashes, uncontrollable shaking, muscle aches, nausea, vomiting, and likely a fever above 101 degrees. In other words, you'll be flat out. The flu is highly contagious and enters the body's airways through mucous membranes. In the case of both colds and the flu, prevention is the best medicine. A nutrient-packed diet can lay the foundation for a strong immune system. Brightly colored fruits and vegetables provide immune-boosting antioxidants as well as all the vitamins, minerals, and phytochemicals needed to maintain healthy immunity. Immune-supportive supplements are critical year-round and especially during cold and flu season. Vitamin D is gaining a reputation as a powerful immune system booster. It enables the body to help fight infections, and studies show that kids taking vitamin D are less likely to catch the flu. Known for its role in supporting immunity, vitamin C helps increase the body's virus-fighting white blood cells. If you do catch a cold, vitamin C can help reduce the duration and severity of symptoms. Start taking it as soon as you begin to experience symptoms. Keep zinc lozenges handy during the winter months. A powerful immune booster, zinc has anti-viral properties. In addition to lozenges, look for zinc in a high-quality multivitamin and mineral formula as well as immune-support formulas at your natural market. Finally, good hygiene will go a long way toward keeping you well this winter. Since colds and the flu are spread through mucous membranes, keep your hands away from your face and wash them often with soap. The Centers for Disease Control and Prevention recommends washing them for at least 20 seconds, or about how long it takes to sing "Happy Birthday" twice.